We were wolfing down lunch in a dank restaurant, and I flicked my wrist. The time flashed, blue and bright on the OLED screen, and my friend’s eyes darted to the wearable. “What is that,” she asked — her interest piqued — her need for some perfect blend of Fitbit and Apple Watch apparent. It’s the Samsung Gear Fit2, and if you’ve ever longed for a wristable that’s more than a Fitbit and less than an Apple Watch then it might be for you. My friend isn’t a big geek for tech, but she is one of the growing population of women eager to get in on the wearable trend. Samsung mentioned the trend when the company first pitched me the Gear Fit2. I was confused about the necessity for the device when the Gear S2 already exists. and the company pointed to women’s apparent preference for fitness bands. Huh. Or maybe I’m reading too much into my gender’s love of the fitness band. Maybe my fellow ladies just really like being able to tell the time and knowing how many steps they’ve walked. I’ll admit to finding it appealing myself. The Samsung Gear Fit2 does all of that, and just as easily as an exceptional tracker like the Charge HR or Alta. Yet, the device also manages to squeeze in the best features of the smartwatch market that men are apparently drawn to like little burly flies to the flame. According to market research, boys like top notch notifications, customissation, and interactivity. Yeah, you can text from the Gear Fit2. 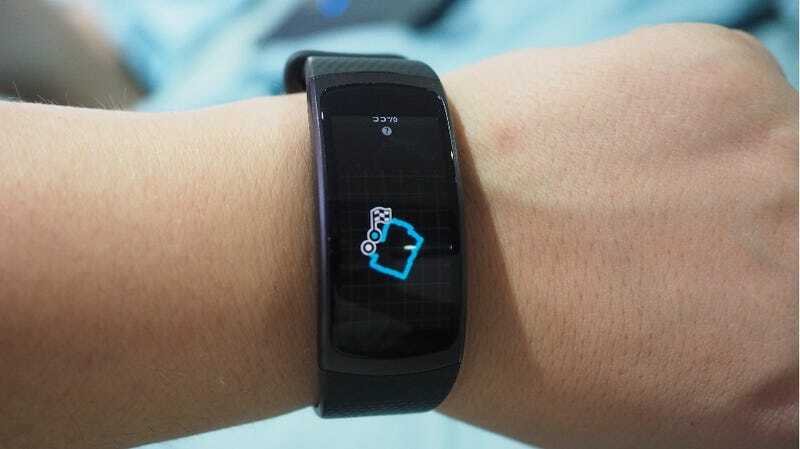 Fitness trackers tend to do one thing: Llg your every huffing step until you get a chance to whip out your phone. If you pay a little more money for it, a tracker may also chronicle the beat of your heart or give you a tiny screen that tells the time. The ones that try to do more usually end up feeling like half-assed combo gadgets best consigned to the bin that time forgot in Maplin. The Gear Fit2 has notifications as customisable, vast, and attractive as those on the Apple Watch or Samsung sibling Gear S2. Many are tied into “apps” built into the tracker — like the one that tracks your sleep and then gives you the length of time and efficiency of your slumber. But the Fit2 also lacks a lot of “traditional” apps. There’s no controlling your smarthome or using a third party calendar or weather app with the Gear Fit2. And I wouldn’t recommend it for all your navigational needs — though it does have GPS built in. The GPS lets track you workout without lugging your phone along, and it works delightfully well. It understood exactly where I was and tracked my path from one side of town to the other with no fuss. It also stores 4GB of your music for streaming to Bluetooth headphones (if that’s your bag) or it can sync Spotify playlists (that’s more my bag). And that’s actually pretty fantastic. Particularly when I was journeying through high heat humidity. Hot weather workout clothes for women tend to lack pockets so we’re either stuck clutching our phones in our hands or shoving them into our sports bras. Neither solution is good for the phone. (The latter has killed more than one friend’s device.) A watch that can handle the music and GPS-tracking responsibilities almost feels like a godsend. I say almost because the Fit2 won’t handle calls, and the battery life is a measly three days in my experience; that's half of what the Alta or Charge HR manage. It also charges via dock instead of USB (but nearly all wristables do now days), and it’s pretty bulky, if attractive and comfortable. Yet bulk and charging are just minor inconveniences. The big problem with the Gear Fit2 is that it’s Android-only. Setting it up and taking advantage of music syncing or notifications or texting all requires some kind of Android device. I couldn’t even move mine out of setup mode until I scrounged up my S7 Edge first. Once fully activated, you can, in a pinch, retire the Android phone you paired with it, but you’ll miss out on a lot of great features, like the ones mentioned above, as well as the ability to dive deep into the results of your workouts. The lack of iOS support doesn’t wreck the Gear Fit2, but it does severely limit the number of people who can use it. Fortunately that friend I was wrecking a bowl of chilli with also rocks an Android phone. She leaned over her meal and peered at the Gear Fit2 with interest. 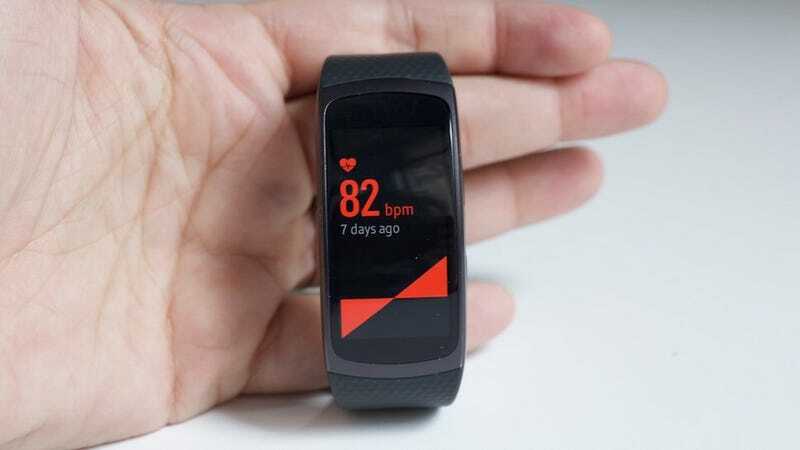 I could see her already willing to justify buying one (it costs $179 in the States, but localised pricing has not been announced) as she watched me scroll through screens displaying my heart rate and steps walked and stairs climbed. 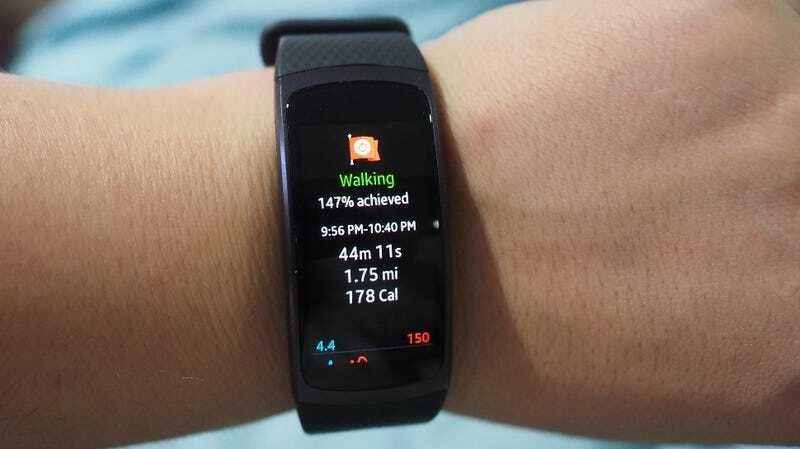 For Android users like her, this is the fitness tracker to covet. Currently Android only. Because Samsung hates fun.